Detail of Eirene Efstathiou’s “We Are Not (Just) an Image on TV,” from “Reverb: New Art From Greece” at the Barbara and Steven Grossman Gallery, School of the Museum of Fine Arts. In “Reverb: New Art From Greece,” a slippery show at the Barbara and Steven Grossman Gallery at the School of the Museum of Fine Arts, Greek artists enter the hall of mirrors that is recent history. In Greece, that specifically means the sometimes fraught four decades since the end of a seven-year military dictatorship that stifled the country. But the underlying message of this show — and the reason it can be frustratingly evasive and intangible — is universal: Everybody’s got a different version of what happened. Curators Eirene Efstathiou and Evita Tsokanta kick the exhibition off with a powerful evocation of this tension. “Ducktator,” a video by Loukia Alavanou, splices propaganda films and Disney animations from the 1930s and 1940s with contemporary images of her Alzheimer’s-afflicted grandmother, who speaks like a news-show talking head, although we can’t hear her. The audio — along with the clickety-clack of a film projector moving the images — includes 1970s Greek news broadcasts. These are juicy juxtapositions. Who speaks the truth here? Is Alavanou’s grandmother any less sincere than the newscaster? Is an individual’s oral history less real than the packaged news? There’s something Cubist about this exhibition, a sense of the world fracturing and coming back together in odd ways, from different perspectives. Eftihis Patsourakis effectively conveys the dissonance in his “Equivalence of Casualties” series, in which he strings together snapshots from the 1970s and 1980s, linking them along their horizon lines. They’re often nostalgic lost scenes of middle-class life, but the connections can be jarring. A man with a parachute descends over a beach full of sunbathers in one photo; in the next, soldiers debark from a small barge. Vangelis Vlahos plumbs the deflections and confusions of the trial of George Koskotas, a banker accused of embezzling from the Bank of Crete. Koskotas implicated government ministers and even the prime minister, who was cleared by the Supreme Court. The scandal was a flashpoint in Greece in the late 1980s and early 1990s. Koskotas landed in jail for 12 years. Vlahos presents fuzzy prints of a photo of Koskotas’s suitcases at Athens International Airport at the time of his extradition from the United States, a timeline of the extradition, and text breaking down the importance of the contents of the baggage, which remain largely unrevealed. It’s a catalog of minutiae, and visually it’s a dud, but in its attention to detail — to the facts at hand — it’s a picture of obfuscation. “Reverb” is a highly conceptual show. Even the sculptures (by Nana Sachini, Anastasia Douka, Paky Vlassopoulou, and Dimitris Papoutsakis) are built on armatures of code and symbol, which get in the way of authentic, body-based responses to the objects. Vlassopoulou, for instance, attempts to create a 3-D version of a song using a variety of materials: ceramic roof tiles cast on her thigh, stacks of encyclopedia pages, a knife. I don’t know the song, and the sculpture revealed nothing. By its very nature, “Reverb” is hard to get your arms around. It’s a heady discourse about the shadow play of history. Good art, no matter how conceptual, ought to envision or embody the sense of absence, the competing interests, and the narcotic allure of that shadow play. Alavanou’s “Ducktator” does that. Another video brings humor and a human protagonist into the story. In Yorgos Sapountzis’s “Knock Knock Monument,” the artist tapes his mother’s porcelain figurines to his face and wanders the streets of Athens at night. He subverts the epic idea of a monument by making this one personal and goofy; he contrasts public history with personal memento. He brings history home — or he brings home to history — and he offers us a way into this show that many of the other artists do not. I suspected Samira Alikhanzadeh’s conceit might be hokey: She inserts mirrors into images of found photos she colors and enlarges. But as I was looking at “#1 (from the series Centennial)” in her show at Robert Klein @ Ars Libri, I had the shop-window experience of not recognizing my own reflection, and the effect was uncanny. It’s a fascinating old photo to begin with. Alikhanzadeh, an Iranian artist, uses photos from the 1930s, ’40s, and ’50s, “a period following the banishment of the veil” in Iran, she says in her artist’s statement. This image depicts a band: eight women, several with instruments, in dresses that predate the 1930s. They pose, apparently grudgingly. Not one of them smiles. 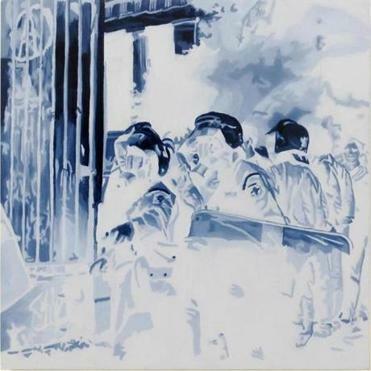 One woman holding finger cymbals appears in mirror image at either end of the group — another technique Alikhanzadeh employs to tinker with our perception of reality. She has covered the eyes of all but one of the musicians with a mirror. If a burka obscures all but the eyes, Alikhanzadeh has inverted that idea. I looked up and saw my own eyes in the face of one of the gloomy drummers, and as I raised an inquisitive eyebrow, her whole demeanor changed. This lasted for just a moment. Once I started looking intently into each mirror, trying to make my eyes fit the face of the woman beneath, the easy confluence vanished — I now recognized my reflection, and it was harder to make the leap into the picture. Still, for a second, the barrier between viewer and viewed had been breached, and it was thrilling. At: Barbara and Steven Grossman Gallery, School of the Museum of Fine Arts, 230 The Fenway, through Oct. 18. At: Robert Klein Gallery @ Ars Libri, 500 Harrison Ave., through Sept. 27.